Should we revel in its "dissonance"? Wisdom literature is one of the most accessible yet perplexing genres within the Bible. The Book of Job explores the nature of suffering, Proverbs gives guidance on matters as routine as avoiding laziness, and Ecclesiastes reflects upon the vanities of life. And yet, Job openly disputes with God, Proverbs lists blatantly contradictory statements side by side (26:4-5), and Ecclesiastes presents such a pessimistic view that an editor felt the need to add a clarifying appendix. 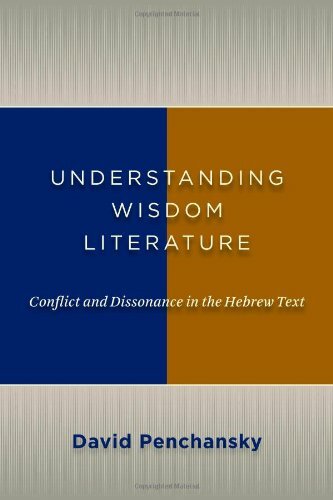 David Penchansky enters this confusing landscape with Understanding Wisdom Literature, but instead of reconciling the tensions within wisdom literature he revels in them. Penchansky develops an interpretive approach that he outlined in 1990 in his treatment of the Book of Job entitled The Betrayal of God: Ideological Conflict in Job (Westminster/John Knox). He works from what has come to be an accepted truth within the guild of biblical studies: most biblical books have a complex development that involved the contributions of multiple scribes or authorial groups. Penchansky scours texts for seams in which the work of the various authors meet, and he then pries them apart. It is here, Penchansky claims, that the interpretive keys are found: textual dissonance marks points at which the editors, tradents, or interpreters of biblical precursor texts tried to conceal disparate voices under the guise of harmony. Instead of following these acts of concealment and discerning a singular message for each book Penchansky divides texts into their constituent, often diametrically opposed, voices. For instance, he says that the people who wrote biblical wisdom literature, the sages, urged their readers to "get wisdom," pitting themselves over and against the prophets, who encouraged and at times excoriated their auditors to "fear God." Penchansky says that these are two totally different perspectives on how to navigate through life. The prophets, he contends, tried to cultivate a "sense of servile, abject terror in the fact of a massively superior and hostile heavenly being," while the sages "figured out the way the universe works" through "their own observations and judgments, constantly tested by subsequent experience." The sages were not shy about their different perspectives, and in their writings they even "fight with each other and against everybody else"; they were "warring parties" engaged in a "clash of wills" with their ideological opponents (whose views also ended up within Scripture). Penchansky applies the theme of dissonant voices to each ancient text that he introduces. For instance, a traditional interpretation of Job focuses upon God's speeches in chapters 38-41 and concludes that God was just in allowing the affliction of Job since God, as creator, is ultimately in power and knows things that finite humans do not. Penchansky challenges this view by locating the interpretive center of the book at verse 42:7, which, he states, results in a different view of God, namely, a god in the wrong versus a god in the right. Since 42:7 represents God as saying that Job spoke correctly, Penchansky says that all of Job's statements are included under this assessment. Accordingly, he says that the book of Job presents God as "poorly governing the world" and that "God unjustly pursues and destroys [Job]." Furthermore, he asserts that "what Yahweh said in the speeches must be all wrong." If this line of thought is disturbing, it gets even more so, since Penchansky says that in 42:7 the voice of God himself admits that this negative picture is thoroughly true. Penchansky repeats this kind of treatment for Ecclesiastes and Proverbs as well as the deutero-canonical works of Ben Sira and Wisdom of Solomon. What is the reader to do when faced with a situation in which biblical texts contain divergent ideas about God? Penchansky answers, "The reader must decide which portion and which voice to listen to, in order to produce a meaning from the book." On a certain level he is right. Characters within the Bible lie, cheat, murder, and steal, and part of reading Bible well is discerning which voices are trustworthy. Few would think that the voice of Pharaoh is presented as normative and Moses was a scoundrel for causing legions of workers to shirk their duties. Even some laws—which seem flatly prescriptive—are subsequently shown to be less than ideal (e.g., Deut. 24:1-4 and Matt. 19:3-9). This leads to a second question: how does Penchansky suggest that readers go about deciding which voice to follow? After he divides Ecclesiastes into three competing voices—Fear God Qoheleth, Enjoy Life Qoheleth, and Pessimistic Qoheleth—Penchansky asks: "Which of the three Qoheleths would I want to be my teacher?" This question is problematic on at least two fronts. First, why do we have to choose just one "Qoheleth"? Does not the book of Ecclesiastes itself teach that "there is a time for everything"? Instead of picking a lone voice to carry us through the vicissitudes of life it seems that this book, and wisdom literature in general, says that we need several depending upon the specifics of the situations that we are in. One of the reasons why the editors of Proverbs had no problem listing contradictory statements side-by-side was that different contexts call for different responses. In the example from Proverbs 26:4-5, there are times in which foolish people, if they are receptive, should be corrected, but when you encounter a foolish person deeply rooted in his own stubbornness it might be best to ignore him. These are different, even opposite, pieces of advice, but this gets to the heart of what wisdom literature is—general truths to be thoughtfully applied to specific circumstances. I love the comment attributed to Barth that the Bible is not Gods revelation, but a report on God's revelation. Certainly in reading the Bible one definitely sees a change in Hebrew theology from its earliest postdeluvial revelation in Abraham of a nomadic God who goes with the tribal band, and then is enlarged, when Rachel sits on her father's household Gods, and grows even larger in the revelations to Moses, that indeed the Hebrew God is not just a God, he is the God revealing himself through the spirit. That sense of revelation grows in both the promise of a Davidic dynasty and the growth of a sense of a personal God as well as a cultural God, a theology that merges neatly into Christianity. It is powerful revelation with the Spirit to accommodate both the literal and the liberal.